To celebrate National Health IT Week, we’re looking at the many ways technology is changing the way we think about healthcare. It’s never been easier to work with huge amounts of information. The rapid advancements in analytics, cloud computing, and machine learning have given us more data than ever before, and the ability to look at it in new ways. 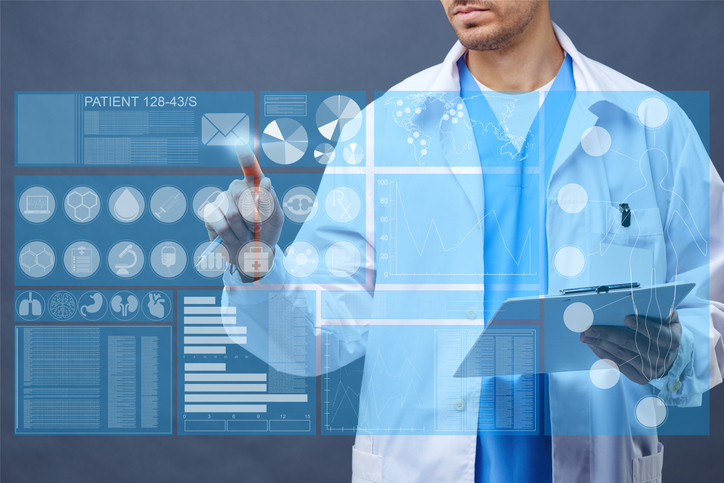 AI promises to be able to help us sift through those mountains of data and gain new insights that can identify risks before they happen and manage costs by helping patients avoid the hospital. Moving forward there are other promising applications like reducing waste and speeding up the drug discovery process. Billing is one of the biggest sources of confusion and frustration in the entire healthcare process. Miscommunications can happen easily, and chasing down people is never fun. Patient Access Solutions make the entire process easier, and also make the audit process a breeze. From instrumentation to prosthetics, to implants, 3D printing is a technology that promises to revolutionize the way that we think about what’s medically possible. As we are able to further and further refine our processes, it has the potential to completely change the landscape. In healthcare, augmented reality has a lot of promising applications that can improve our ability to keep information organized, avoid mistakes, and improve quality of care. The possibility to pull up information on a patient during an interaction makes everything more personal and powerful. The promises of nanotechnology are vast, but its reality may be here sooner than you think. A team of researchers from the US, Switzerland, and South Korea have already succeeded at creating nanorobots that can deliver drugs to soften clogged arteries, and then drill through the blockage. Controlled by an MRI machine, this technology looks to have wide-ranging applications, but there’s a little more that needs to get worked out in the lab before they can move on to human test subjects. Google has created a Life Sciences division of Alphabet called Verily, which is partnering with Johnson & Johnson to also explore the technology. Looking to the future, as our need to rapidly interface with computers and digital information continues to grow, it may make sense to leverage recent advances in neural interface technology. This concept, known as cyborgization, will let humans and machines work together seamlessly in a variety of contexts to deliver quality care in ways we never thought possible. From providers being able to precisely control the movements of robotic surgical tools to patients who have integrated systems that track vital stats and warn of any impending trouble, the possibilities are endless. Key advances in fields like genomics, proteomics, and cytomics are making easier than ever before for health professionals to predict trouble before it happens. Predictive diagnostics combines what this information tells us about a particular patient’s risk for disease with other information like aging curves and environmental factors. This can help providers to prevent the problem, or significantly reduce its negative impact, which cuts down on costs and improves quality of life for patients. Wearables are already collecting tons of useful information about patients, but the “Internet of Things” has much more in store for healthcare going forward. The IoT can automatically transmit data collected by hospital equipment, like heart monitors or respirators, directly to a patient’s EMR. This saves time normally spent manually entering these stats, but more importantly, it lessens the chance that someone will make a data entry error. An IoT solution can seamlessly integrate all of the data coming from these varied sources to help providers see the big picture. Other applications help ensure quality care outside of the doctor’s office, with RFID labels on prescription bottles that help patients stick to the schedule, and shipping packaging that can ensure the authenticity of medication. Seeing a doctor for something relatively routine can be expensive. Not just in terms of your copay, but also in terms of the time it takes for you to get to the doctor and for the doctor to fit you into their schedule. Telemedicine has been in use for years to give people in remote places access to regular healthcare, but with ubiquitous streaming video and broadband connectivity, we’ll see its use increase as people get more and more comfortable with living and working remotely. For providers, it means that they can fit more patients in and give in-person patients more time. Patient history is a key part of providing quality care, but often the biggest obstacle to a good history is the patient themselves. By putting all of a patient’s information and medical history in one place, patient portals can help you pull up the information you need wherever you are. Filing prescriptions electronically is on the rise for a number of good reasons. It cuts down on errors, speeds up medical reconciliation, alerts providers to possible bad interactions or patient allergies, and improves adherence. Digital diagnostic resources are getting more and more robust. With 4K video and high-res cameras in everyone’s pocket, getting a second opinion to confirm a tough diagnosis is easier than ever, and there are more and more places to look if you’re having trouble on a tricky case. Cognitive technology leverages increasingly digitized records and advances in AI to process large amounts of data in new ways, identifying patterns that can help predict disease and catch it early. Other uses include computer vision, machine learning, and natural language processing. Health records and PHI are central to compliance for providers, and also a major source of anxiety for healthcare IT professionals tasked with security. Blockchain has two key components: a public transaction log that cannot be changed or altered, and the encrypted data that it protects. It stands to improve care by tying patients to their data, rather than their identity. Chatbots are easier than ever to set up and can make interactions between patients and providers easier and more personal. They’re also scalable, which is great news if you’re trying to figure out how to take a load off of the folks who pick up the phones by answering routine questions. Sometimes even the best provider needs advice on a tough case. Crowdsourced diagnosis can help by taking the case to a much larger community, giving you access to outside-the-box thinking. New experiments in AI are influencing course of treatment. For rare cases, it’s easier than ever for providers to pull up relevant research and case studies that give them an idea of how to proceed, and what is going to be best for the patient long-term. Look at how your data is stored, and how you can use new tools to learn more from it. Connect devices to better coordinate care. Use digital resources to make diagnoses more accurate. Leverage AI to analyze data and spot trouble before it happens. No matter what business you’re in, connectivity forms the backbone of how you get things done, communicate with your customers and market your business.